The Digby DrillBot is a Physical type weapon. The scientists of Digby used their knowledge of tunnel digging technology to create the ultimate mouse adversary. Using its two massive high-speed drills this titan can easily destroy any mouse put in its path. The Digby DrillBot can be purchased for 404,340 gold from the Town of Digby. It refunds for 72,780 gold at the same location. The Digby DrillBot can also be assembled from Digby DrillBot Parts if obtained from loot, or reassembled from the same if unintentionally smashed. The Digby DrillBot has the special property of enabling Scrap Metal loot from Steel mice. Chrome DrillBot – A Chrome version of the DrillBot. Smashing this weapon with the Hunter's Hammer yields the Digby DrillBot Parts. 10 July 2008: The Digby DrillBot was introduced. 21 July 2009: The Digby DrillBot became smashable with the Hunter's Hammer. 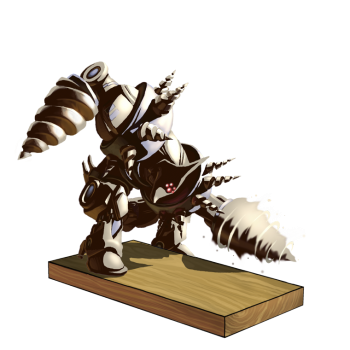 10 August 2010: The Digby DrillBot gained the effect of causing Scrap Metal loot drops from the Steel Mouse. This page was last edited on 13 January 2019, at 13:15.